Many years ago now I toured several newly built Adirondack homes in the lakes region of New Hampshire. I was in the early planning stages of building my vacation home on Lake Winnipesaukee in New Hampshire and wanted to get some construction ideas for it. One of the key features that stood out to me while touring the homes were their decks. In every case they were built out of Mahogany wood. Both the decking and the rail systems. Besides looking very well constructed the dark reddish color Mahogany wood had a unique character and beauty about it that I immediately fell in love with. Consequently I did some research into Mahogany wood and shortly thereafter decided to use it for the deck material on my new home. Summarized in the paragraphs below is a short compilation of my research findings on Mahogany wood and why it is a preferred material on higher quality deck construction. To start off with, there are a number of species and colors of Mahogany wood found throughout various parts of the world. Consequently there are just as many varieties of Mahogany wood decking choices to choose from. However, finding Mahogany wood decking material to buy is not always easy to do. For example, Home Depot has historically only carried it in stores located in more expensive housing markets. And even then, they typically only carry a single species and color, and in just a small number of dimensional board types. When considering the use of Mahogany wood it is important to note that though there are a number of species to choose from they are not all the same. Some are harder and denser than others, and have different coloring. Also, not all Mahogany wood is as resistant to moisture and insect decay as others. In general, harder wood will hold up better to the environment, but it is difficult to cut and fasten down. For example, American Mahogany, and more specifically Honduras Mahogany, is the species of Mahogany wood that has the dark rich red color that I had observed when touring the Adirondack homes, and what I ended up using on my deck. It is also a very dense and hard wood thus making it less likely to twist, check or split. But again, since it is such a hard wood, you need to pre-drill holes in the wood when attaching it to the deck floor joists with stainless steel screws or nails. American Mahogany comes from Central and South America, Mexico, and the West Indies. As a result, it is fairly local to the North American housing markets which helps to keep costs of the material from not skyrocketing too much. This said, Mahogany decking wood and rail systems are significantly pricier than pressure treated decking products, but not much further off from composite decking material costs. Though a pricey decking material choice, deciding to go with Mahogany wood is well worth the investment. Nothing really beats it in terms of its durability, quality or looks. 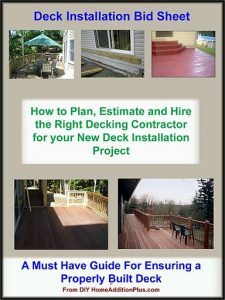 Use this Deck Installation Checklist and save time and money on your deck project. From an aesthetic point of view I found putting an outside band (single 1”x4” Mahogany board width) around the perimeter of the decking surface to be an attractive choice. It effectively creates a kind of picture frame type look around the main decking area. I installed this outside band first. After installing the outer frame band, I then installed the main Mahogany decking boards within it. From my perspective the use of the outer band frame created a much cleaner and more distinctive decking surface. As I already mentioned above, it is important to use stainless steel nails or screws, or other such fasteners when attaching Mahogany decking boards to the deck floor joists. And again, if you don’t plan to use a nail gun, you’ll need to pre-drill pilot holes prior to hammering/screwing the fasteners into place. Mahogany wood is just so dense the nails and screws will not penetrate it without using pilot holes. They’ll simply bend over before they penetrate into the wood. Also, I found stainless steel nails better to use than the hex head screws. The screws somewhat chewed the wood when penetrating into it and leaving somewhat of a ragged finish in the surface of the decking boards. In regards to the mahogany deck railing system, stainless steel bolts and screws should be used exclusively. I suggest using carriage bolts on the deck posts for securing them to the deck frame and screws for attaching the rails and balusters to the deck posts. 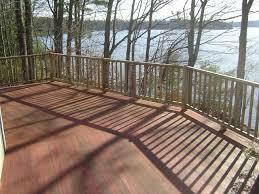 Though Mahogany takes both stain and paint well, I highly recommend clear sealing your Mahogany wood deck. It would be crazy to cover over the beautiful Mahogany wood with paint in my opinion. Moreover, if you are going to stain, paint or clear seal it make sure to do all six sides of every board. In addition, apply a top quality sealer every couple of years to keep it looking like new. You can also choose to not stain or paint the Mahogany wood at all as it is nearly impervious to the weather elements. It will bleach out, however, to a grayish look over time. This color may be an appropriate color for an ocean side home, but for a lake home I prefer maintaining the darker red look. Also, if you don’t seal, paint or stain the Mahogany wood decking boards, they will slightly check over the years. Nothing compared to pressure treated decking lumber, but they will check. So be forewarned. To conclude, since completing my research on using Mahogany decking lumber I have personally built two Mahogany decks. Each deck has been up now for over a decade and they are both still holding up strong and looking beautiful. Once the outer frame is installed, then the main Mahogany decking boards can be simply installed within this outer framework. The result is a cleaner line when viewed from a distance or standing on the deck itself.